RoslyPokharel Uprety holds a Master’s Degree in Sociology. She has studied Master’s Degree course on ‘Conflict Resolution and International Humanitarian Law’ from the Kathmandu School of Law. She has coordinated and lead different projects and program for last10 years. 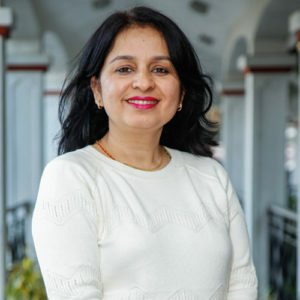 For last seven years, she has been working as Program Coordinator with Institute of Human Rights Communication Nepal – IHRICON, where she is responsible for providing strategic direction to the program, coordinating and managing partnerships with donors, civil society organizations, Community Groups, government stakeholders and local political leaders for their better collaboration and coordination. She has an ample professional experience on gender and social inclusion issues.